Another great visit with the Portland Storm NHL team! These guys are like a big family with their wives, kids, girlfriends, siblings, etc. all along for the ride. It’s always a pleasure to dive into another of the hunky player’s stories! Levi “501” Babcock has lived his whole life under his big brother Jamie’s shadow. Jamie is the Captain of the Portland Storm hockey team that Levi now plays for as well. He can never manage to one up his big bro, and ever since he hit the big league, he’s doing worse than ever at it. Cadence Johnson is coming off the high of winning gold in her figure skating career, but also off the low of the drama she faced with her former partner. She’s come to Portland to meet with a possible new partner while she’s staying with her big brother Cam “Jonny” Johnson, also on the Portland Storm team. Levi has had a crush on Cadence for awhile, so when he runs into her at a team party, he asks her out. She’s very gun shy and wary, but decides to go out with him as friends. They are soon spending more and more time together, when her life is thrown into a tailspin again when her ex shows up in town. 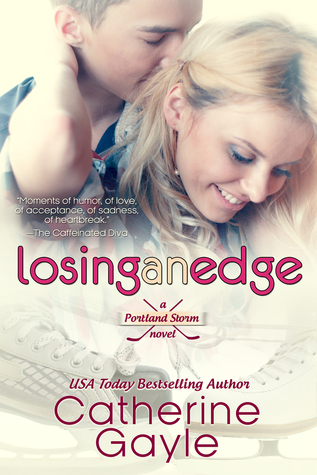 Will Cadence decide to be honest with the people around her before it’s too late?